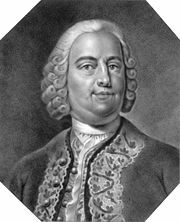 Carl Heinrich Graun (May 7, 1704 - August 8, 1759) was a German composer and tenor singer. Along with Johann Adolf Hasse, he is considered to be the most important German composer of Italian operas of his time and earned a prominent place in the Baroque School of Opera. Along with operas, Graun also composed passions, cantatas, concertos, trio sonatas, and organ music to bring out his interest in sacred music. Graun felt that ethical behavior should be exhibited in the service of love, and he composed his sacred music so that those who heard his compositions would know of the power of love. Graun was born in Wahrenbrück, in Brandenburg. He sang in the chorus of the Dresden opera before moving to Braunschweig (city), singing there and writing six operas for the company. He was kapellmeister to Frederick II of Prussia (Frederick the Great) from his ascension to the throne in 1740 until Graun's death nineteen years later in Berlin. Graun wrote a number of operas. His opera Cleopatra e Cesare inaugurated the opening of the Berlin opera house in 1742. Others, such as Montezuma (1755), with a libretto by King Frederick. None of his pieces are often performed today, though his passion Der Tod Jesu (The Death of Jesus, 1755) was frequently given in Germany for many years after his death. His other works include concertos and trio sonatas. Carl Heinrich Graun was the brother of Johann Gottlieb Graun, also a composer. John W. Grubbs has written an exhaustive biography and thematic catalog, The sacred Choral Music of the Graun Brothers. History of "Carl Heinrich Graun"
This page was last modified on 11 January 2017, at 16:40.